She started it all. Without her there would be no agility in the King household. She was the inspiration for my logo that I use everywhere. She was amazing, remarkable and about the best friend a person could ever want. She was naughty and loving, kind and mean. She never met a stranger and once she met you, she was your best friend for life. She taught me about dog training, agility, distance and lead outs. In the year 2000 I told Mel I wanted a standard Poodle. 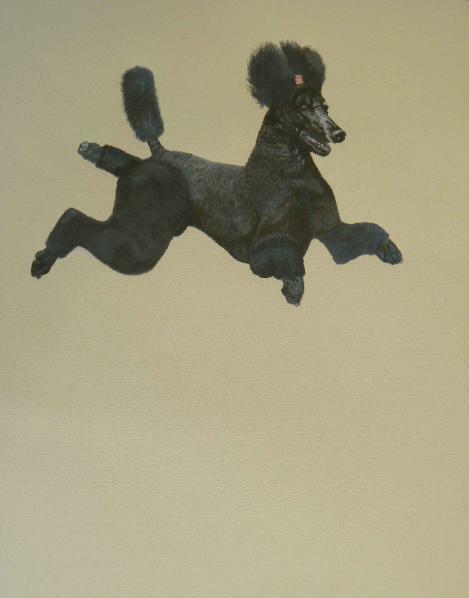 He responded, “Over my dead body!” I replied, “How would you like to go?” I reminded him that I had wanted a standard Poodle since I was fifteen years old. The year was 1965 and I had gone with my mother to pick up our horrible, evil mini Poodle from the groomer, Esther Akerly, in Topsfield, Massachusetts. Besides grooming, she raised and showed standard Poodles. I remember standing inside the front door waiting for my mother, when this very large, very black and very hairy dog came bounding through the house and jumped up on me. He put his paws on my shoulders and stared into my eyes. I saw something in that dog I had never seen in a dog before. All I could say over and over again for the next month or so was that he was a person in a dog suit! I couldn’t get him out of my head. 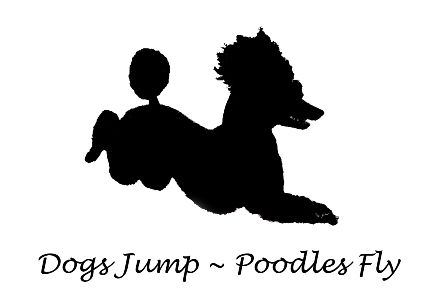 The time was never right to get a Poodle, but that day in 2000, I knew it was then or never. Mel went on to say, “OK, if you get one, I refuse to be seen with it! I will not walk it, I will not feed it, I will have nothing to do with it! You are on your own!” We all know how THAT played out! I knew he was full of it. He was afraid his masculinity might be questioned, which really surprised me! Normally, he was very secure in who he was, but this Froo Froo Poodle threw him for a loop. Our wonderful old dog Bear was getting very old and we needed another dog so when she left us, the pain would not be quite as great. My friend of forty years, Jane Treiber, a breed show judge so she was familiar with many dog breeders, found a standard Poodle breeder for me. I contacted her and got on the list for a puppy. I was so excited I could barely contain myself! It was finally going to happen after 35 years of waiting! 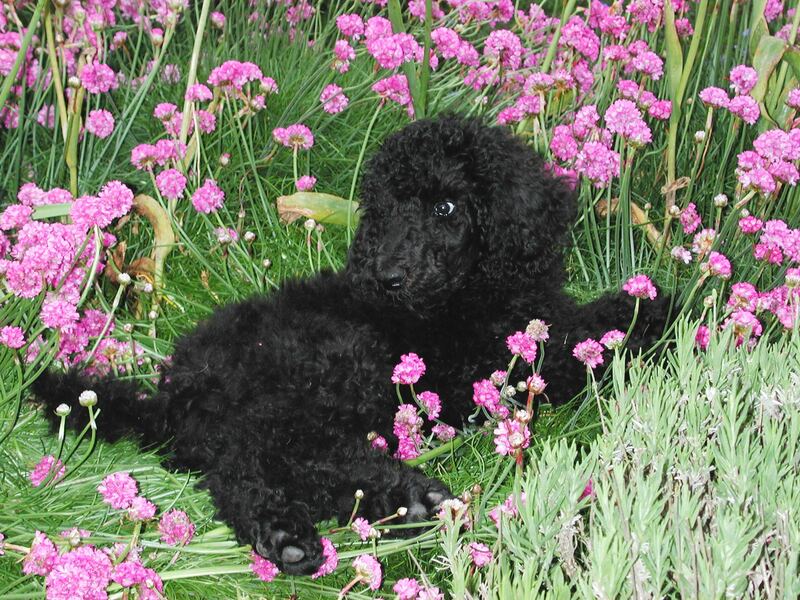 The father of the litter was a top winning sire with MANY Bests in Show, including several at the Poodle Club of America Specialty. The dam was a group winning champion. I had my name already picked out, Queen of Spain; call name Isabella. Coincidentally, the dam’s call name was also Isabella. I took that coincidence as a sign that it was meant to be. When the time came to get our puppy, we drove to Bothell, Washington where the litter was born. The breeder put us in a room and went to get the two remaining puppies from which we got to pick. She opened the door and put the two pups on the ground. I got down on the floor and called them. One ran and hid but the other ran as fast as she could and jumped into my lap and leapt around like a wild thing. Without missing a beat, I said, “This one’s for me!” SHE WAS CAWAZY! Mel wanted the other one. He felt sorry for it because it was so timid. I would not budge. I wanted the CAWAZY one. On the way home she lay on the floor of our truck and never made a peep. We had brought our old dog Bear with us but she hoped we could get our money back. Isabella figured out how to make Bear Dog love her and they became inseparable. Isabella followed Bear everywhere. We would dress up Bear for Christmas every year and she loved it. Isabella was underwhelmed her first year in costume, but she grew to love being adorned in various things throughout her life. We lost Bear to bone cancer the following year. She was 14. We still miss her after all these years. Bear’s mother was a Border Collie and her father was a champion Rottweiler. It was an oops breeding but she was the best dog we have ever known. After Bear was gone, I went online searching for a dog to adopt to keep Isabella company. I found a face that was an Aussie mix and I fell in love. She was in our local shelter so we immediately got in the truck and drove over to see her. She was petrified of us and life, but it was love at first sight and we brought her home. She was a feral dog and it took some doing for her to adapt to home life but eventually, she fit right in and she and Isabella became best buddies. When Isabella was six months old, I decided to take her to obedience class. I would have shown her in breed competition, but she had developed an horrific overbite. I didn’t know much about training dogs, except that as a teenager, I had trained my German Shepherd to happily run hundreds of feet from me to jump in the pool or jump over the horse fence. I had trained many horses and ponies but dog training was a different story. My only experience with formal obedience was when I was about 15 or 16 and I took my GSD to obedience classes with my older sister, Pam. It was all jerk and pull training back then and I didn’t like it but had no clue how else to train so I quit going. The first class I took with Isabella was taught by a very punitive man. He believed in shock collars, prong collars and lots of corrections. I went looking for something better. The next instructor was slightly better but still not what I thought was fair for my dog. Then I found a clicker trainer. At our first lesson, I spotted some agility equipment in the bushes and asked what it was. She explained agility to me and I said, “I want to do THAT!!! !” Isabella and I never took another obedience lesson again. We had a blast in agility! Isabella began showing signs of digestive issues at a very young age. Certain things made her very uncomfortable and she would moan and groan most of the night. I took her to many different vets but they could never figure it out. She also suffered from something in her mouth but I was not sure what it was. I took her to EIGHT vets for that before one of them, my friend Dr. Kathy Wendt, figured out immediately that her lower canines had grown through the roof of her mouth. We took Isabella to a canine orthodontist and he ground them down and filled them. He removed rocks, bone and food from the holes in her palate! NO WONDER SHE HAD PUS COMING OUT OF HER NOSTRILS!!! He said she was lucky it had not gone into her brain and killed her! With her teeth fixed, she felt like a new dog! Her joy and flair for life returned and she became her old obnoxious self. Isabella was three years old at the time and had suffered for years from her dental condition. She was amazing. Her digestive issues got worse and worse and the things she could eat got less and less. She saw so many vets but no luck in figuring it out. Finally, we took her to a specialist who scoped her. We had had her scoped a couple of years earlier but he only took stomach samples, not from her intestines. This new vet said Isabella had “severe IBD (inflammatory bowel disease).” She wanted to put her on heavy duty steroids and immune suppressant drugs (the kind they give to transplant patients so they don’t reject donor organs). Isabella, 23” tall, had gone from a lean but healthy 42 pounds down to a very skinny and unhealthy 36 pounds. The vet told me Isabella would be dead in six months if I didn’t put her on those drugs. She was four years old then. As a vegan myself, I knew that people with IBD and other autoimmune issues got great relief from a healthy vegan diet. I decided to try it with Isabella. I switched her to Natural Balance Vegetarian dog food. She thrived and stopped regurgitating her meals! As long as she remained vegan, all was fine but as soon as she got even a tiny piece of animal protein, she would get sick as hell. About a year before that, shortly after her teeth were fixed, Isabella had her first seizure. It was a focal seizure, also known as a partial seizure. It was not the grand mall type where they flail around like a flounder out of water, she would just be out of it and vibrate. When it stopped, she would act like a newborn foal trying to stand. She continued having these seizures for about a year or so before we put her on medication. They happened every few months but began to happen more frequently. We chose to put her on Keppra because it was the least damaging to the system of all the drugs. It worked great. One day in the winter of her fourth year, we took all the dogs to the beach after a trial. Isabella had barked and barked at the beach and seemed stressed. Once back at the RV park, she started pacing up and down our trailer. It was obvious something was wrong. I had had Great Danes that had bloated so I knew what it looked like. She had none of the signs. She was not trying to vomit and her stomach was not distended at all but I knew something was terribly wrong! Mel took her outside to walk her and she was trying to chase squirrels. We went to bed and I brought her in bed with me. She was motionless now and her eyes were glazed over. I knew it was emergency vet time! As I got her out of the car and headed towards the vet hospital, she then began to wretch. Now I knew she was bloating for sure. X-rays showed she had bloated and torsioned. They did surgery on her to flip her stomach back and tacked it so she would not torsion again. It did not prevent her from bloating, however. Over the years, Isabella bloated about a dozen times. I always found a vet to lavage her stomach and she always bounced back. I was told on many occasions that her system could not take any more stomach pumpings but I knew her will to live and love of life was so great that she would come back over and over again and she did, much to the amazement of the many different emergency vets who treated her. She had a knack for finding food that would make her sick. Then she would gorge herself on the forbidden delicacies only to bloat again. One time it was horse poop in the far corner of a field in Colorado where, by the time we reached her, she had eaten so much it was obvious the emergency vet was our next stop but mostly it happened when Josephine, the biggest counter thief of all time, dragged down some treats from the counter or ripped open a sealed box in the shed full of treats. Isabella had not had an incident since Josephine passed a year ago. Isabella was such a character. She loved to show off, chase small critters and try to kill something whenever possible. Once at an agility trial, we were at the warm up jump and there was a top winning Papillion not far away obsessing and yapping at the ring. Isabella took off and ran over to it, grabbed in her toothless gums and began mauling it! I managed to grab her and she let go before any damage was done, but it was very scary! Luckily, the owner was a super nice woman and she liked me so no charges were filed and Isabella got to keep doing agility, but I never took her to a warm up jump again! I just couldn’t trust her. She was hated at most dog parks when she was young because she would relentlessly poke other dogs with her long nose until they went at her. If people brought kids to the park, she would run them down and poke them to make the scream. She loved chasing squeaky things, human, canine or otherwise. It didn’t matter as long as they protested in a squeaky voice and ran, they were fair game for her. She adored my granddaughters and was always great with them. She also loved herding sheep. Isabella’s Joie de vivre was obvious to all her knew her. It was captured beautifully in a painting a woman from England did of her. She contacted me to ask if she could paint this from one of Isabella’s photos. I said sure! It was chosen to be placed on display at the Kennel Club gallery for all to see. It was so fitting for Isabella to take such a high honor! Isabella had long hair for several years. Then I got the idea to shave her all over and a tradition for King Poodles began! After she was spayed, I would ask her where her “booboo” was and she would lift her back leg to show me her tummy. That is how she got her nickname Boo Boo many years ago. After that, whenever she would get hurt, she would lift her back leg to tell me she hurt someplace. She could be so sweet, it broke my heart when she got hurt. Isabella fell off the dog walk too many times to count. It never bothered her one single bit. She always jumped right back on it. She was fearless. Once her teeth were fixed and her infection cleared up, she stopped falling. I guess it made her balance off. DUH! She only had eyes for me and wouldn’t run for anyone else. Here is another attempt by Uncle Jef to run Isabella that ended in her choosing to ditch him. This time she got about half way through the run before she gave him the finger and left. Uncle Jef and I always joke and say that Isabella thought that only her Gramma really knew how to do big jility and Uncle Jef and everyone else SUCKED! She taught me so much about agility and life. She was so honest in the ring and always gave me her all, no matter how badly she might have been feeling. I didn’t know any better back then. Even with all of her health issues, she managed to become and AKC agility champion. I retired her at six years old, just shy of MACH 2 because I felt it was the best thing to do for her. I never regretted that decision. Two weeks ago, at the age of 14 years and almost 3 months, Isabella’s body finally had enough. It was time. She fought so bravely for so many years to stay alive. Up until now, I was unable share the news because it was just too painful. Only a very few people in my life knew. The tears will not stop as I write this and I know it will take a very long time before I can talk about her without crying. On Monday, June 16, 2014, I got down on the floor with her for the last time and wrapped my arms around her frail and failing body. Sobbing, I told her how much I loved her. I gave her “kissy head” for the final time. She never looked up. She was ready. Her spark was gone. Mel took Isabella to the trial with him in April of this year because I was too sick form the chemo to deal with her special needs. He dressed her for the last time. 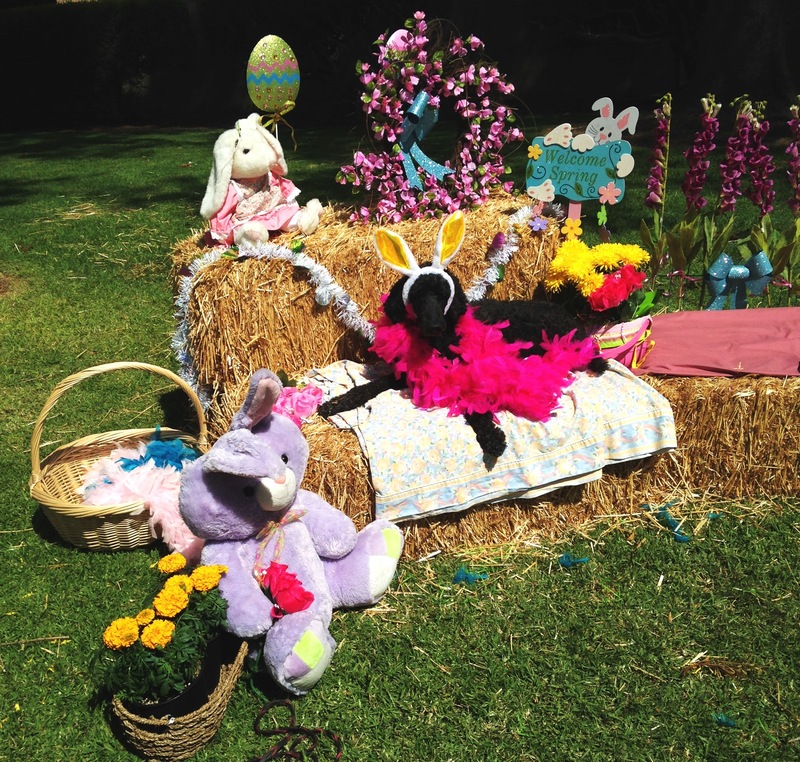 She so loved being dressed up. She still had some life left in her then, but that flame slowly faded as the months went on until the flame could no longer be seen. When Isabella was young she was afraid to jump so I taught her to fly! Every time I hear the song All of Me I cry. It sums up my relationship with Isabella. She always gave me her all. Sometimes her all wasn’t much and sometimes it was breathtaking. It didn’t matter to me, I knew it was always the best she had to give me. I was so lucky to know her. This one’s for you Boo Boo. I love you so much Isabella. I will miss you forever and a day. There will never be another like you. Good-bye my Boo Boo. Your individual responsibility for you to get the particular message all through came into existence somewhat effective and have absolutely regularly made it possible for workers much like me personally to arrive from their particular desired goals. I am so very sad to hear Isabella is gone. She has been my heroine since reading about her years ago…what an amazing, courageous, spirited, beautiful survivor was the Queen..the poodle world is emptier without her! Helen and Mel: my heart goes out to to for your loss, there are no words. Hugs. I am so very sorry for your loss. In time the pain may soften for you and only the good times will remain in your heart. Thanks Moe. Camp was really tough at times. I didn’t tell anyone because I didn’t want to have to talk about it. Helen, so sorry about Isabella. It is such a great loss, I know how hard it is and how much our good friends mean. God Bless. 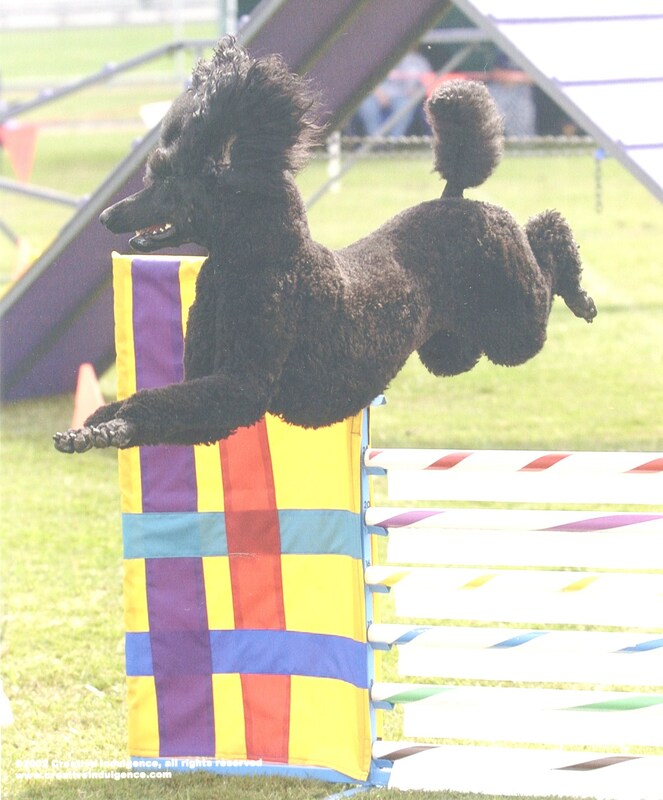 Helen, you and Isabella are such an important part of my poodle/agility life. Even though I have only met you a couple times @ trials, I feel I know you so well throughout your blustery opinions and wit. I have traveled with you and Sir Cusalot over the years in the Global Warmer and was blown away when you got Crushie. 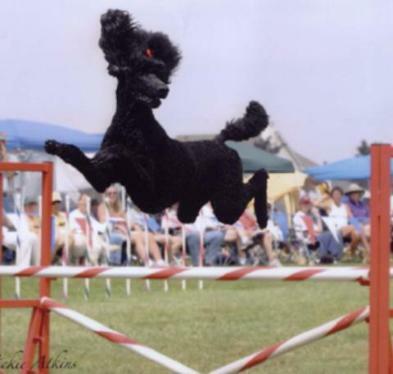 You have been an inspiration to us here in poodles land now with our McNabbie “RAE”/ I lost my soul mate , ZUNI who you met in Long Beach @ the Poodle Regional agility trial. We sucked but had fun. Anyway, I am crying for you and all opus that loose a piece of our hearts with every loss that comes when you choose to LOVE something/someone. Isabella taught Viva how to fly, and inspired my flying dog T shirts! Diane, Viva & Rae + Zuni rainbow bridge. PS : today is Zuni’s 11th birthday. He almost made it. your beautiful and eloquent words are so fit for the queen! we were both green together (ruby and I definitely were!) and look at the journey isabella led you on. Helen, though we never met, I feel your pain. I lost my sweet boy Rudy last summer and still cry with pain. He was my heart dog. The intensity and power of your deep bond with Isabella is so evident in your videos and incredible tribute. I pray for peace for you and Mel. So sorry, Helen. I dread the time when I must feel your pain at the loss of my dopey poodle, Decie. It seems unfair that dogs live so few years. Your tribute makes me cry. I’m so sorry for your loss Helen/Mel. I am so sorry Helen. Godspeed Isabella. Beautiful tribute for your dog, I’m glad I got to meet her…. Oh, Helen, I am so very, very sorry. Isabella had the most heart of any dog I’ve known. Big hugs from me and the poodle boys in Atlanta. Isabella left with quite a legacy. Through you both, many of us learned what to watch out for with our poodles, whether it was teeth, bloat, IBD issues and especially jility. That was so many years ago. Perhaps she stayed through your fight and knew you were alright now. Many tears for you both right now. Tears for you and Mel, but what a special girl she was! Oh Helen, I remember way back when meeting you and Isabella through Std. Poodle World. I had Ramoneah then. We talked for them of parties and nail polish, may they party together now. I know you pain and I’m crying for you. Much love and hugs! My heart breaks for the loss of your Isabella. My heart dog Ollie left me close to 14 years ago and I still cry for him! There are no words of comfort to take away the pain that you are going through but know that you are in my thoughts, my prayers and my heart. Hearts ease to you Helen and to Mel. I am so very sorry… When you lose someone you love, you gain an Angel you know.